BSN Medical in South Africa a multinational company embarked on a global green initiative with the objective of reducing their impact on the environment as well as reducing their operational costs. 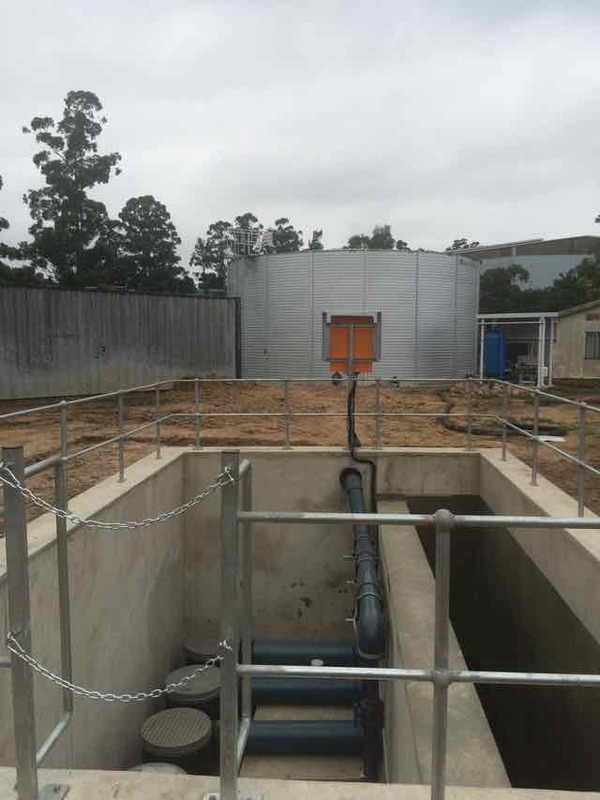 The Tizagenix water division was selected to design and install a mega rainwater harvesting system at their Pinetown factory in Durban South Africa.The installed system has recovered over 10 million liters of rainwater during the past 12 months. The objective of the project was to design and install a rainwater harvesting system to recover rainwater from hard-surface areas totaling 16000m2. The recovered water is used as process water in the factory. Rainwater recovered from the factory roof drain into a 500mm storm-water pipe system 3.5m below ground where it had to be recovered filtered and transferred to an above ground rainwater storage tank. From the storage tank the water had to be treated and used as process water for boilers, cooling towers and other non potable process water applications. Total tank volume as specified - 500 000l with ability to expand to 1 000 000 liters. 93% rainwater recovery efficiency at average rainfall rates for the area. Average daily process water consumption: 50 000 to 70 0000 liters. Payback period of less than 5 years. A design that can be easily expanded to recover water from a bigger surface area. In the final design concept storm-water (rainwater from the factory’s 16000sqm roof) is intercepted in the underground storm-water pipe and diverted to a bank of primary rainwater filters which separate the rainwater from the solids debris in the water. The filtered clean water is transferred to a holding tank from where it is pumped to the main above-ground storage tank. From the storage tank the rainwater is pumped and treated treated for use as process water in the factory. The design consisted of of a rainwater recovery system constructed below ground level. Rainwater from a 500mm underground pipe would enter an open channel. 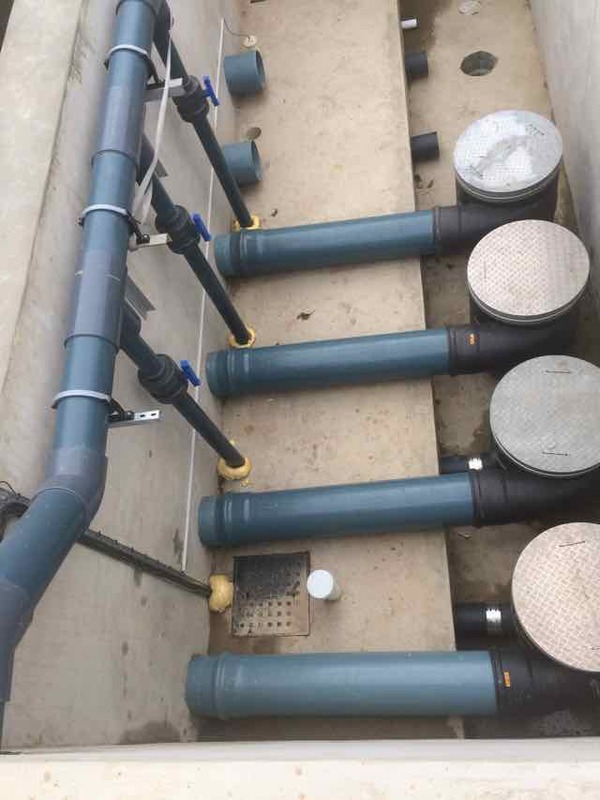 A primary rainwater filter manifold was constructed into the open channel where the flow behavior of the rainwater could be monitored and controlled. Wisy WFF300 primary rainwater filters are connected to the manifold and they filter and remove debris from the harvested rainwater. The excess rainwater from the filters which are used to clean the filter elements are discharge back into the main storm water line. The clean filtered water from the WISY WF300 filters flow into a clean water sump below the filters. Calming inlets are used to to reduce turbulence in the clean-water sump. The clean-water sump has three submersible pumps that pump the filtered rainwater water to an above ground storage tank. 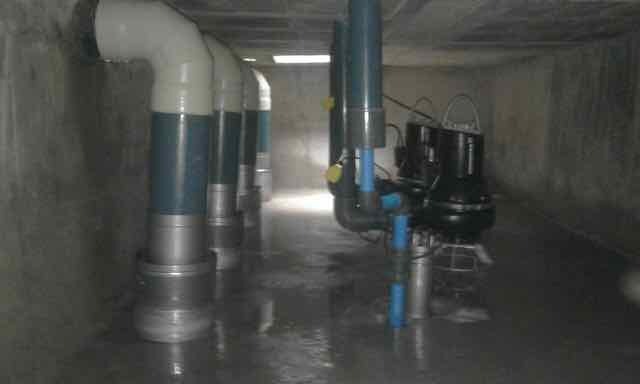 A control system controls the level in the sump, automatically stops and starts the pumps and deactivates the complete system if all the water storage tanks have reached full capacity. 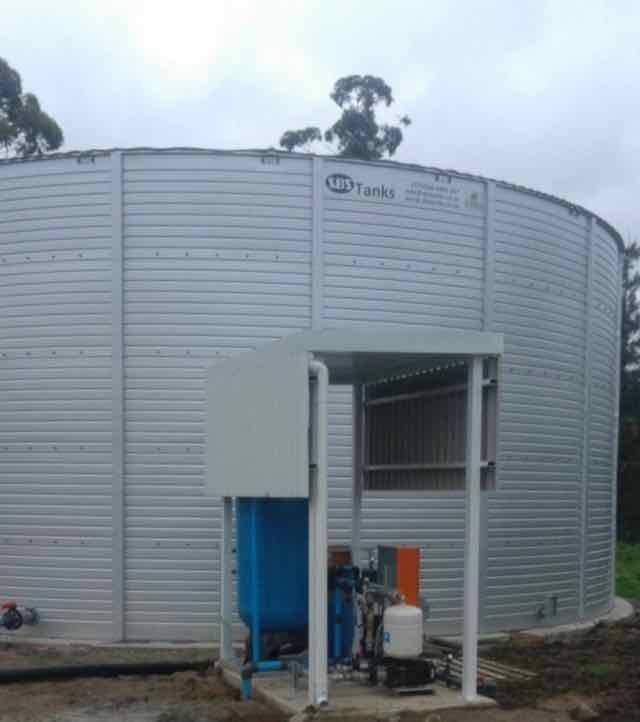 The client had specified a 500 000 liter above ground storage tank. An SBS tank with an inner liner was constructed as a rainwater storage tank. Water from the clean water storage sump tank the harvested rainwater is pumped into the above ground storage tank via a 200mm pipe connected to an internal water diffuser. 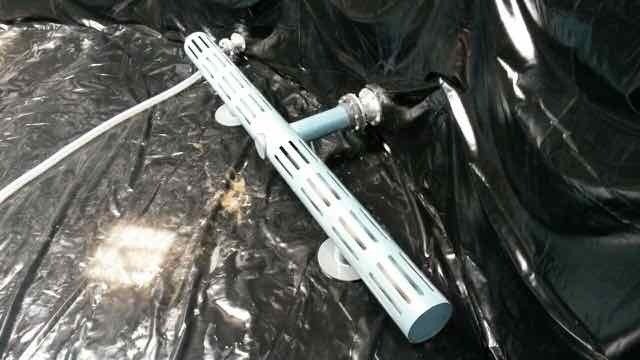 The diffuser is designed to to minimize water turbulence and disturb the sediment on the bottom of the tank. Clean fresh water is in the storage tank is drawn from a floating suction, 500mm below the level of the water to a set of booster pumps that supply the water to the factory via a forced filtration process. The filtration process consists of a primary sand filter, secondary disc filter and a final polishing bag filter. The booster set pumps use variable speed drives designed to operate on pressure demand while supplying water to the biolerhouse and cooling tower. Our company specified WISY WFF300 primary rainwater filters that would form the heart of the system. These filters were incorporated in the design of an underground sump recovery system. The filters makes use of a vertical mesh screen to separate the en-trained debris in storm-water, anything larger than 0.38mm. The filtered debris gets flushed out the 316mm discharge nozzle at the bottom of the filter. These filters on average 95% efficient, ie. 95% of the rainwater entering the filter leaves through the 200mm filtered water discharge nozzle.A useful trait of the filter design is that water stops flowing through the filter element when the filtered water chamber is full. This can be used for level control of the tank, by setting the filter at the same height as the maximum fill level of the tank. Calming inlets in the underground clean water recovery sump reduce turbulence from the recovered rainwater that will affect the submersible pumps. The 3 calming inlets reduces water turbulence in the storage tank when water flows in at maximum capacity 62l/s. It also prevent sediment from being stirred up from the bottom of the tank which ultimately will affect the water quality and put pressure on the forced filtration system. The floating suction ensures that the oldest water in the system is used first. Fresh water is introduced into the bottom of the tank and the “old water” is removed from just 500mm below the surface. This water is also the cleanest and it ensures proper water quality rotation inside the storage tank. The system has been designed that when it rains the submersible pumps will pump recovered rainwater up to a maximum flow-rate of 62l/second. 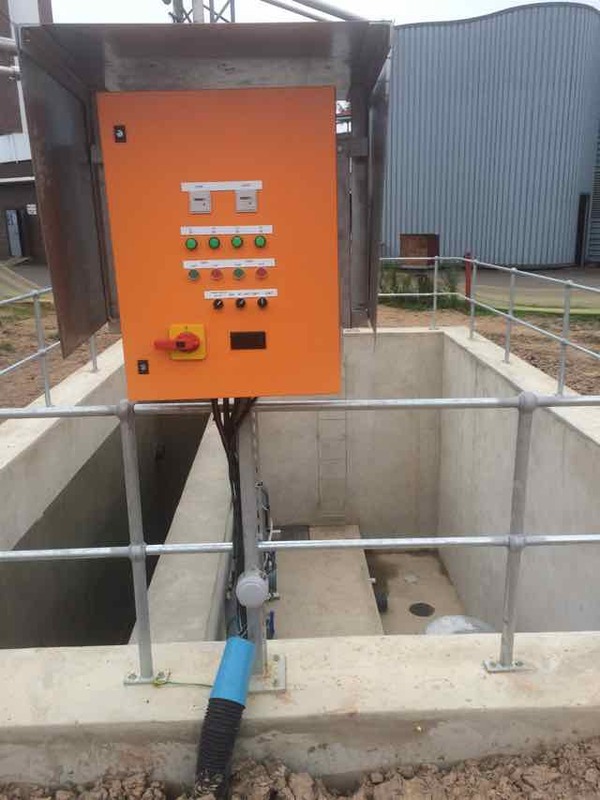 The pumps are connected to a level probe and control system that stop and start the pumps at certain levels within the clean water underground tank. Water volume in excess of that capacity simply bypass the system and is directed to the storm-water discharge of the property. When the storage tank is full after approximately 33mm of rain , the large sump pumps and are turned off. In heavy rains this will result in the sump tank filling up. The sump structure has been designed to make use of the WFF300’s level control capability. This means that water cannot overflow out the manholes of the sump tank. When the sump tank is full, water stops flowing through the filter element, and flows directly through the flush-line of the filter into the flush-line manifold. This protects the system and prevents any flooding of the property. See sump pump control system below next to the recovery sump. In order to comply with the design requirements a simulation model of the system was created on Matlab® Simulink®. The objective of the simulation was to investigate the systems’ expected performance, and to establish the expected efficiency of the overall system. A rainfall input signal was created that delivered the same rainfall pattern as the recorded average for Durban. The simulation found the system to have an overall efficiency of 78.1%. 8% of the rainwater is lost through the self-cleaning action of the proposed WISY filters and the remaining 13.9% is lost as a result of the tanks reaching full capacity and no longer being able to accept water. The results show that 12.5 million liters of rainwater per annum is expected to be harvested a year by the system. 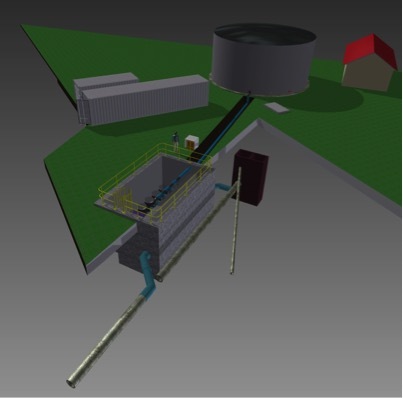 The simulation also showed that if 2 additional WFF300 vortex filters are installed and an additional 500 000l of rainwater storage capacity the efficiency of the system will improve to 92%. 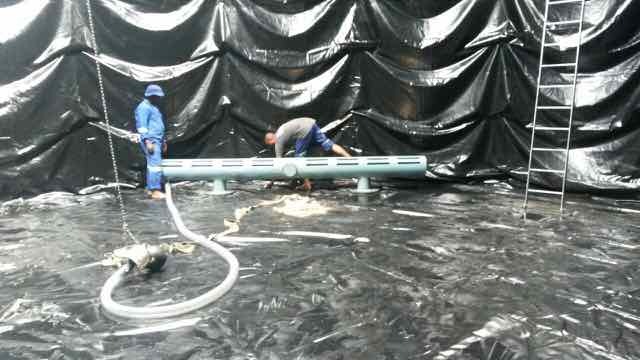 From the photos it can bee seen that the design has allowed for the installation of the extra filters and sump pumps. A detailed project plan was developed a the start of the project highlighting the critical path and key steps to deliver a successful project. For construction our team had to build the underground recovery system, 5m below ground on bedrock level within the factory premises. Construction of the underground system took about four months to complete. During the construction period Durban received a record amount of rain over a four day period which delayed the final project completion date. Key challenges were the positioning of pipes and fittings into the concrete walls in order to achieve the correct levels and ensuring that the system is completely waterproof. Parallel to the construction of the underground recovery system the 500 000l tank was built. 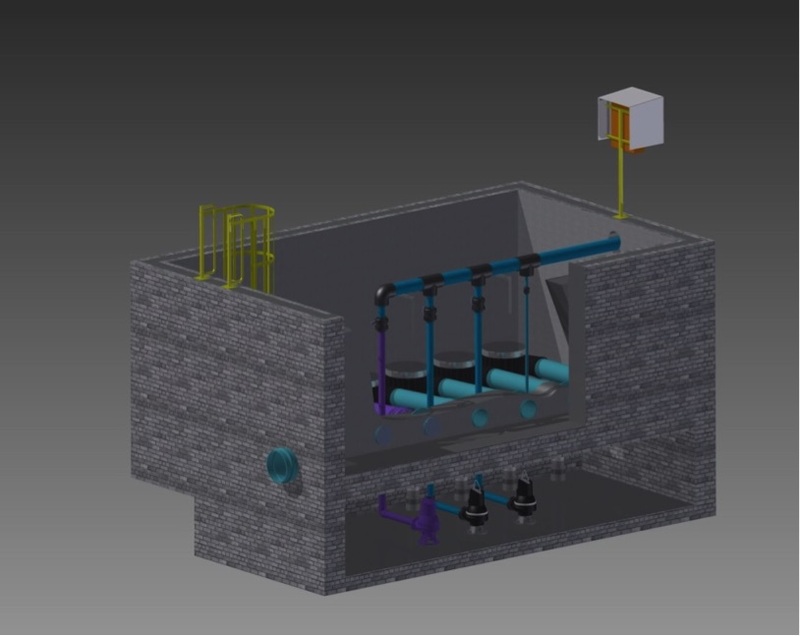 All other water treatment components was designed and built as modular systems and installed on site at the appropriate time during the project. 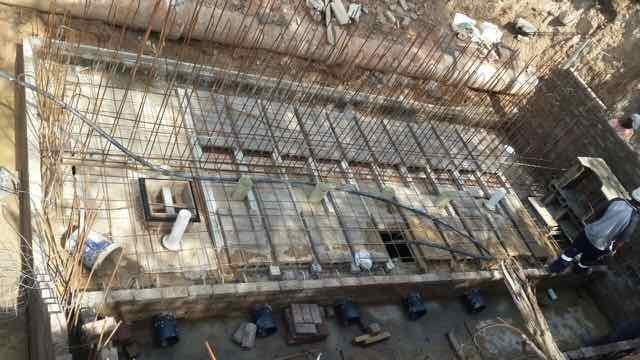 The most critical part of the project was the tie-in's into the main rainwater and storm-water recovery pipe. The pipe was 3.5m below ground level and the system had to discharge to a pipe 5m below ground level. As part of the design 500mm PVC underground pipe connections were manufactured to exact fit. Excavations around the system was done and the construction team was prepared to do the connections. It was important to complete the tie-ins in one day and that no rain fell during this period as it would have flooded the whole construction area. Tie-ins was done successfully and the system was prepared for commissioning. Dry commissioning was conducted on all pumps and systems without any rainwater in the system. Wet commissioning could only be done after rain was recovered in the system. 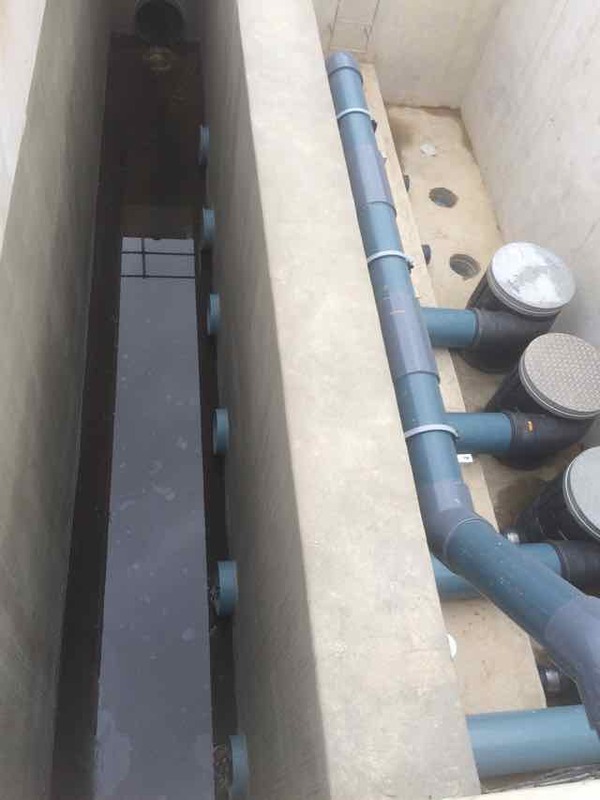 The first step during the wet commissioning process was to test the recovery efficiency of the Wisy WFF300 vortex filters and to test the bypass capability of the system in-case of power failure or when the storage tank was full and the sump pumps could not further recover any rainwater. Fortunately during this period 15mm of rain was recorded over 20 min period and the underground system effectively handled the bypass flow volume without flooding the sump or property. After the first test all pumps and equipment was systematically started and tested to ensure optimum performance. 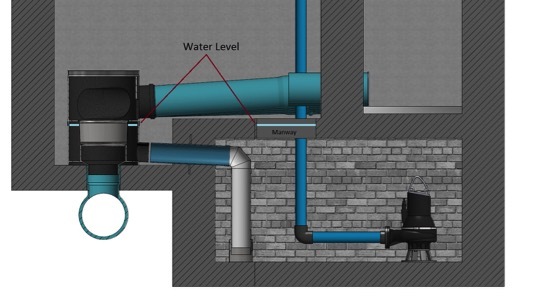 The sump pump level controls system uses level sensor to sense the level in the clean water sump-tank. Based on the level in the clean water sump-tank, the control system starts and stop the sump pumps. Due to the nature of our plant it could only be tested and fine-tuned during periods of rain. Three months after final commissioning the project team handed over the project to the customer. During this period our team was able to verify the system performance and all aspects of the design including the operation and maintenance of the plant. 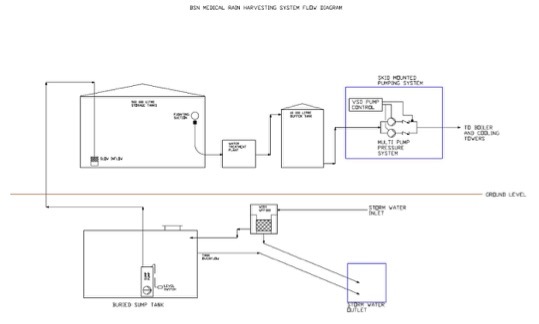 For the three months that our team was monitoring the rainwater recovery system it had recovered and supplied 1 630 000 liters of rainwater and supplied it as process water water to the BSN factory.